Jaguar’s F-Type Coupe is stiffer, sexier and more sensible than the Convertible with which it shares much in common. But what's it like to drive? Jaguar’s F-Type Coupe is stiffer, sexier and more sensible than the Convertible with which it shares much in common. In high-performance ‘R’ form, it’s also significantly swifter than anything else wearing an F-Type badge. The R Coupe is, unsurprisingly, the model chosen by the resurgent Brit brand for a long-range preview for select media. Every one of the pre-production cars at the Circuit de Catalunya event in January packed the 405kW version of Jaguar’s supercharged 5.0-litre V8 beneath its sleek snout. This is a useful 41kW more than the F-Type S V8 Convertible, the most powerful of the soft-top line-up. As with the Convertible, all Coupe models use a ZF-made eight-speed automatic with Jaguar’s ‘Quickshift’ control software. Half the R Coupes gathered at the racetrack outside Barcelona were equipped with the model’s standard brakes, and half with the expensive carbon-ceramic discs to be offered as (an expensive) option. 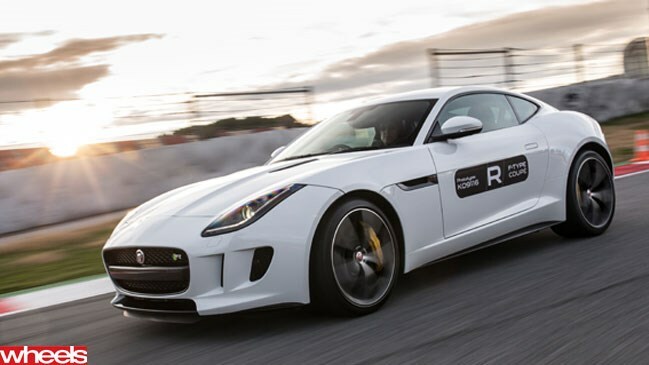 A circuit isn’t the place to learn anything useful about important everyday characteristics like ride comfort and powertrain refinement, but Jaguar has clearly nailed the extreme speed and handling end of the F-Type R Coupe’s performance envelope. The car has a specific suspension and drivetrain calibrations and is equipped Jaguar’s most advanced dynamic enhancements. Between its rear wheels is a second-generation version of the company’s Electronic Active Differential, which works in parallel with a first-for-Jaguar Torque Vectoring by braking system. Both are intended to increase the R Coup’s agility to the highest level ever achieved by a production Jaguar. Jaguar’s 0-100km/h claim is 4.2 seconds, just a fraction less than the S V8 Convertible. The R Coupe needs all the help it can get to make best use of its extra power and torque. A quick and smooth lap of Catalunya demands careful management of the engine. Short-shifting proves a good tactic to reduce rear-end slippage and increase mid-corner stability through some corners, and corner exits always demanded discretion. But get into the area where the electronic differential and the line-holding electronics do their thing, and the R Coupe feels brilliant. Partly because the basic hardware is excellent. The steering, which shares its rack with the Convertible, is precise, fluid and informative. The carefully honed balance of the chassis is always evident. And the standard brakes are fine, although drivers who regularly need to stop hard from 200km/h-plus will find the optional carbon ceramic system worth every extra cent. But the most exciting thing about the R Coupe is what it promises for the lesser Coupe and S Coupe models, powered by the same 250kW and 280kW versions of Jaguar’s supercharged 3.0-litre V6 as used in the F-Type Convertible. The Coupe is only around 20kg lighter than the Convertible (blame tough new US roof-crush regulations, which don’t apply to soft-tops), but the all-aluminium body 80 percent stiffer. In fact, the F-Type Coupe has greater torsional stiffness than any other road-going Jaguar ever produced. The arch of the Coupe’s roof line and the way its cabin tapers into the car’s tail, emphasising its deep-drawn aluminium haunches, also adds to its visual appeal. Finally, the Coupe has a useful cargo compartment. It’s not huge – 315 litres up to the parcel shelf, 407 litres up to the tailgate glass – but it handsomely beats the paltry 150-litre or so boot of the Convertible. The F-Type Coupe is scheduled to launch in Australia in late June. Expect the price of the R Coupe to be a little higher than the $201,945 of the S V8 Convertible, and the V6-powered Coupe and S Coupe to be slightly less than the $138,645 Convertible and $171,045 S Convertible. Jaguar expects the Coupe to eventually account for more than 50 percent of F-Type sales globally. It’s certainly the body style those with an eye for beauty and a nose for practicality should choose.